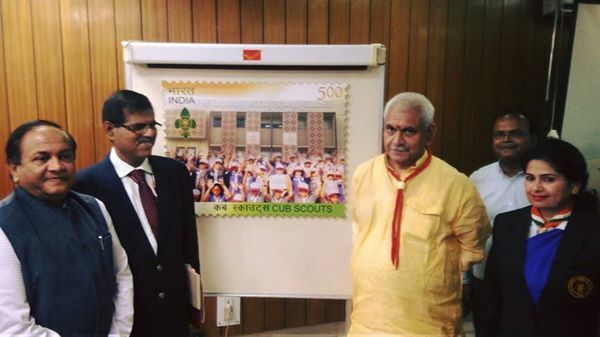 New Delhi: Minister of Communications Shri Manoj Sinha today released a Postal Stamp on Cub Scouts to commemorate Centenary year of Cub Scouts in India and Abroad. Speaking on the occasion, the Minister said that Scouting aims to support young people in their physical, mental and spiritual development, so that constructive role can be played by them in the society. He said that Bharat Scouts Guide had played an important role in the overall development of the country and they are also playing an active role in road and rail safety, Swachh Bharat Mission and during natural calamities apart from many developmental activities. Shri Sinha expressed the hope that scouts will continue to play an important role in future too. Cub Scouting is meant for children of age group between 8 to 11 years and Cubbing involves games, stories, play acting, handicrafts and also work through the Star tests and Badges. On the other hand, Scouting was developed for youth between the ages of 11 and 17 to engage in activities in public parks, open spaces and wherever they found a suitable place. Shri Sinha said that the mission of Scouting is to contribute to the education of young people, through a value system based on the Scout Promise and Law to help build a better world where people are self-fulfilled as individuals and play a constructive role in society.